New ISIS text calls on Muslims who are active in pro-Palestinian groups in the EU to rise up, conquer Rome by 2020. Pro-Palestinian rallies and groups are being used to aid the rise of Islamic State (ISIS) in Europe, according to a book the group released this month - united under the front of "bringing down Zionsim." The book, Black Flags from Rome, encourages European Muslims to rise up and aid ISIS from within, according to a report on the PJ Media website - and notes that terror cells have already been formed. “If you have ever been at a pro-Palestine / anti-Israel protest, you will see many activists who are not even Muslims who are supportive of what Muslims are calling for (the fall of Zionism)," it continues. "It is most likely here that connections between Muslims and Left-wing activists will be made, and a portion from them will realize that protests are not effective, and that armed combat is the alternative." Such “recruits” being lured to ISIS due to frustration over their lives “will give intelligence, share weapons and do undercover work for the Muslims to pave the way for the conquest of Rome," the book also predicts. The text also gives detailed instructions on building Molotov cocktails, beginning local "turf wars" to aid in the process of Islamist land-grabbing, and consolidating extremist groups to build armies. The point, it says, is to lead to an armed takeover of Europe - and it presents a highly intricate plan that includes battling local mob bosses to storm Rome, with the aid of such widely available planning tools as Google Earth. It predicts a defeat of a Russia-Iran alliance and the Italian army for an ISIS takeover of Italy by 2020. The plans surface amid a rising tide of anti-Semitism in general, with a recent study demonstrating that attacks against Jews have risen 383% worldwide since 2013, including a 436% hate crime hike in Europe. 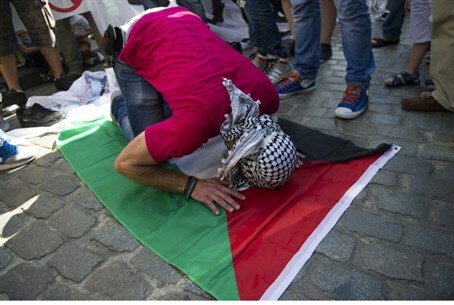 Pro-Palestinian protests were common - and, often, violent - throughout the European Union during summer 2014, in the course of Operation Protective Edge in Gaza.